This is part of my round the world trip in August/September 2014. 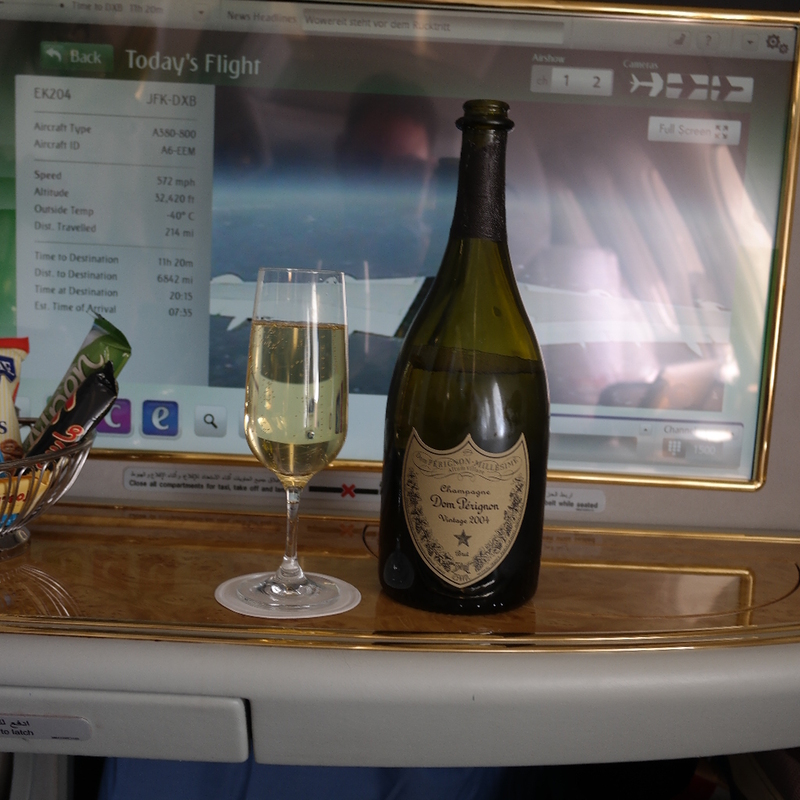 For those that are big on premium airline products, I think Emirates’ A380 is near the top. Its not as over the top as the Etihad Residences, but, its pretty over the top. 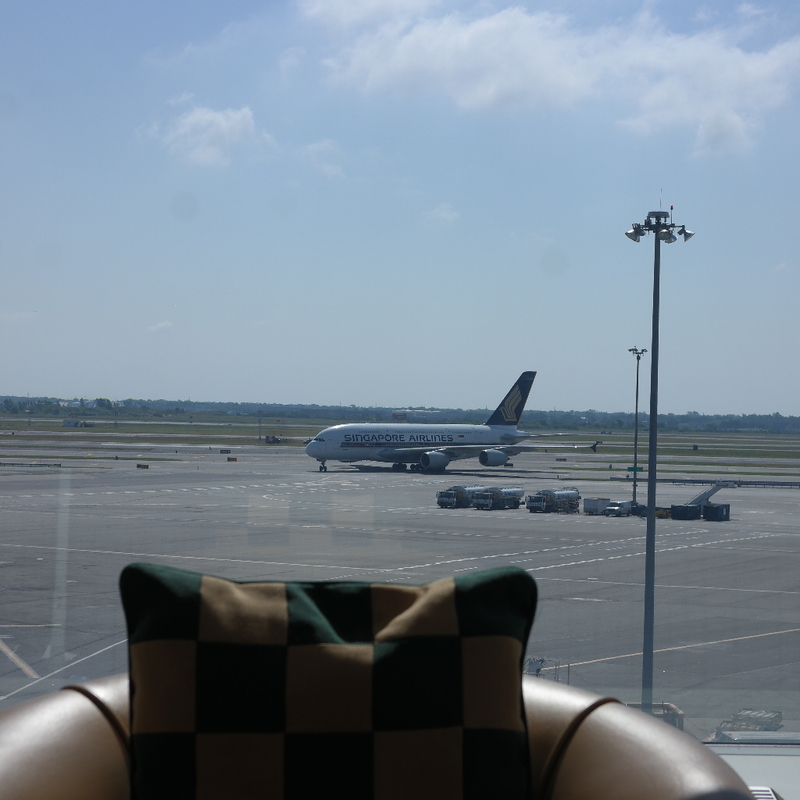 We had stayed at the Sheraton JFK Airport Hotel the night before, because, we really didn’t want to leave anything to chance with us missing this flight. 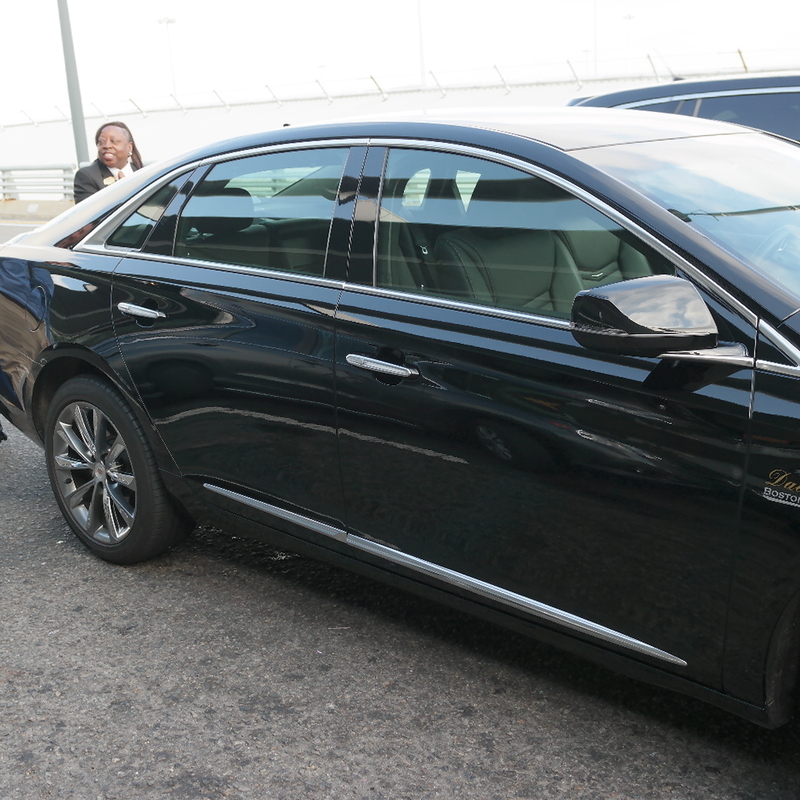 We had arranged for transfer via Emirates Chauffeur since Emirates offers to premium cabin passengers. When we flew Etihad earlier this summer, we had the standard Lincoln Towncar, so when we walked out of the hotel, we were pleasantly surprised with a Cadillac. 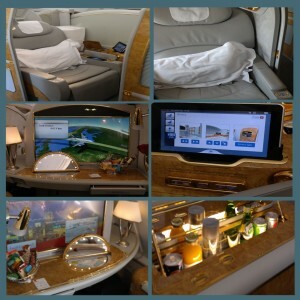 Not a huge difference, but, it is consistent with Emirates’ over the top-ness. Emirates has a two counter First Class check-in area close to the door (I neglected to photograph that). I will note that checking in took a bit more time than expected because our boarding passes didn’t automatically print out with the lounge invitation. I’m not sure why, but Alaska award tickets are treated like “reduced fare” or “travel industry” tickets, but its not a big deal to get this fixed, you just have to make sure that they know you’re not flying on a reduced fare ticket, and they are able to fix and reprint. With that worked out, we were soon through security and in the Emirates lounge, which is a pretty good size. 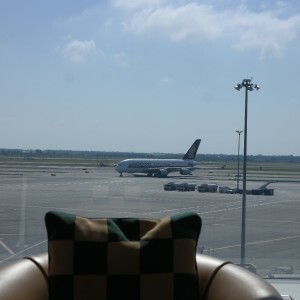 The lounge itself has a dining area, a sitting area (with some great views of the tarmac), a smoking area, showers, and two jetways (one to two different gates). 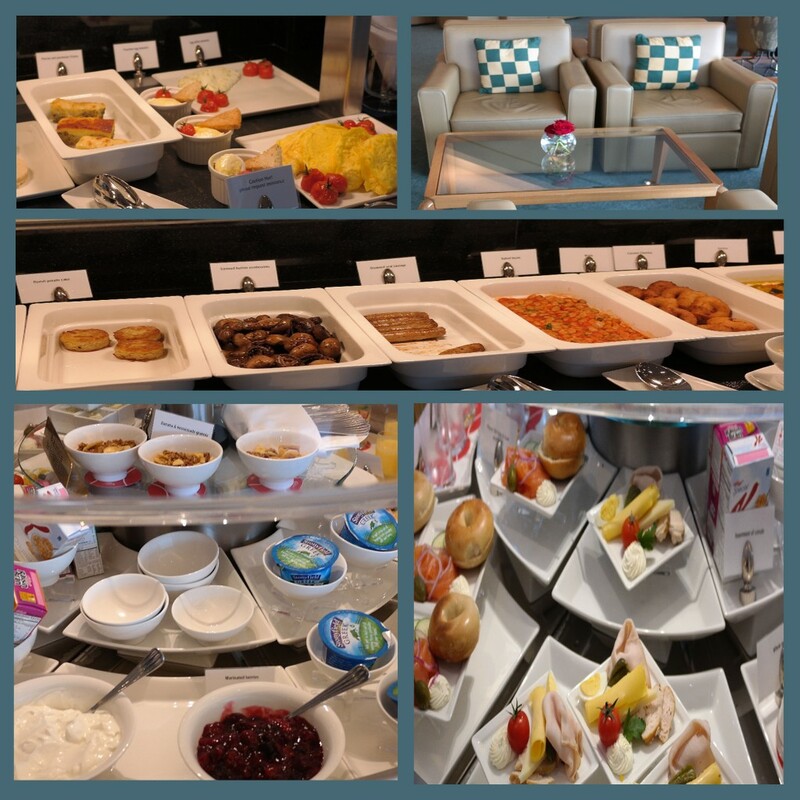 We grabbed a light breakfast, and did some planespotting. Before long it was time to board. Emirates is the only airline that I’ve flown that have a jetway from the lounge to the aircraft (its the jetway to the upper deck, UL1 according to one of the cabin staff). 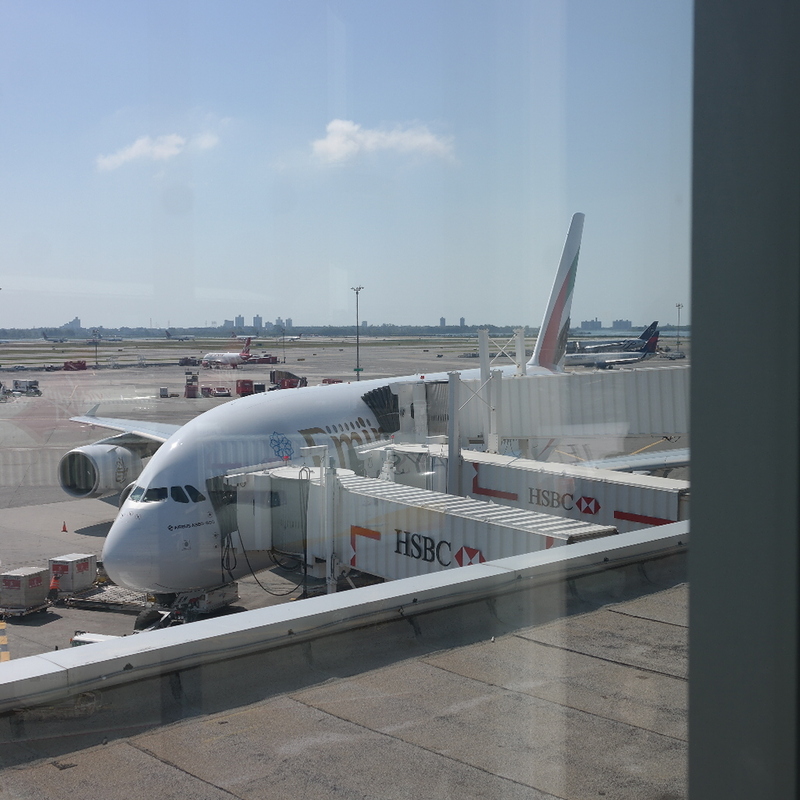 Boarding the Emirates A380 from the lounge. Once onboard, we were shown to our seats, 1F and 1K. 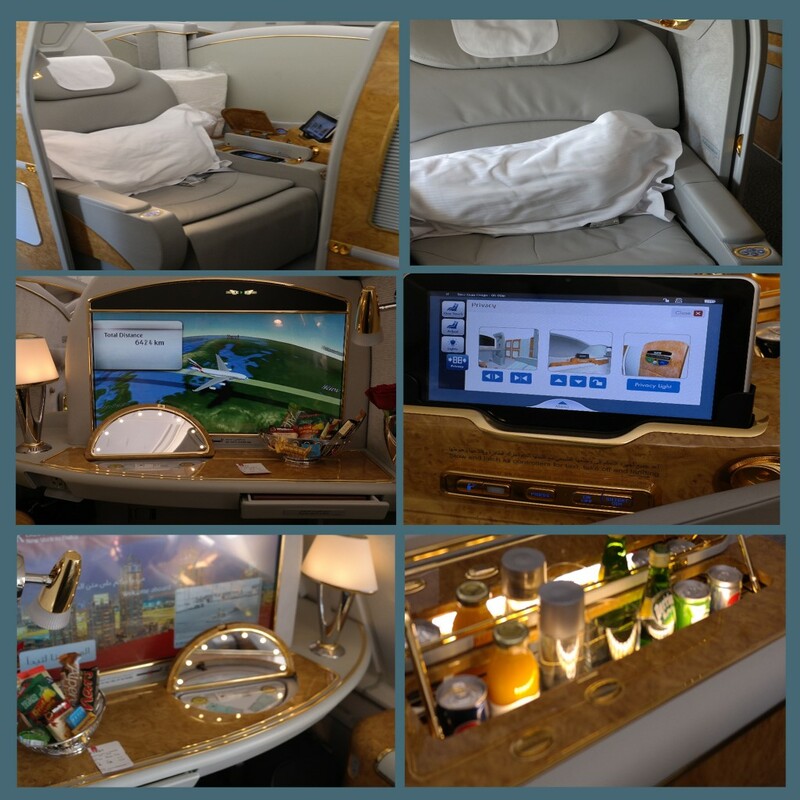 The seat itself was comfortable, but it was the overall suite that was over the top. As if we thought that was enough, as we were sipping Veuve Clicquot champagne, we received eye shades, slippers (note, usually airline slippers don’t fit, but they actually had extra large size), a rather large amenity kit, and pajamas. They gave us “beach bags” to carry it all. Once we were in the air, I had a glass of champagne, Emirates serves Dom Perignon 2004. I decided to have a meal shortly after take-off, although I didn’t remember to take pictures of the menu. Between my wife and I, we tried a good selection. 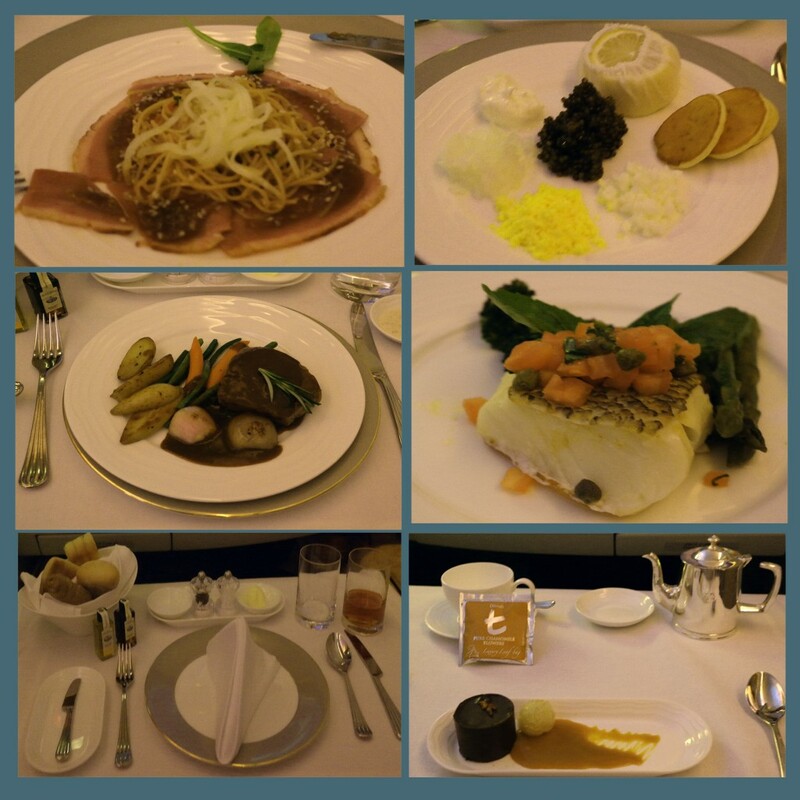 The first row were the appetizers; duck, and Caviar, second row were the entrees; steak and halibut (I think — my wife had it), the final row was the place setting and desert. After dinner I took a walk around the plane,and ended up in the business class lounge / bar area. We had a bunch of fun there with the crowd and excellent crew. After some time at the bar (and few measures of great Hennessy Paradis), we opted for some sleep. 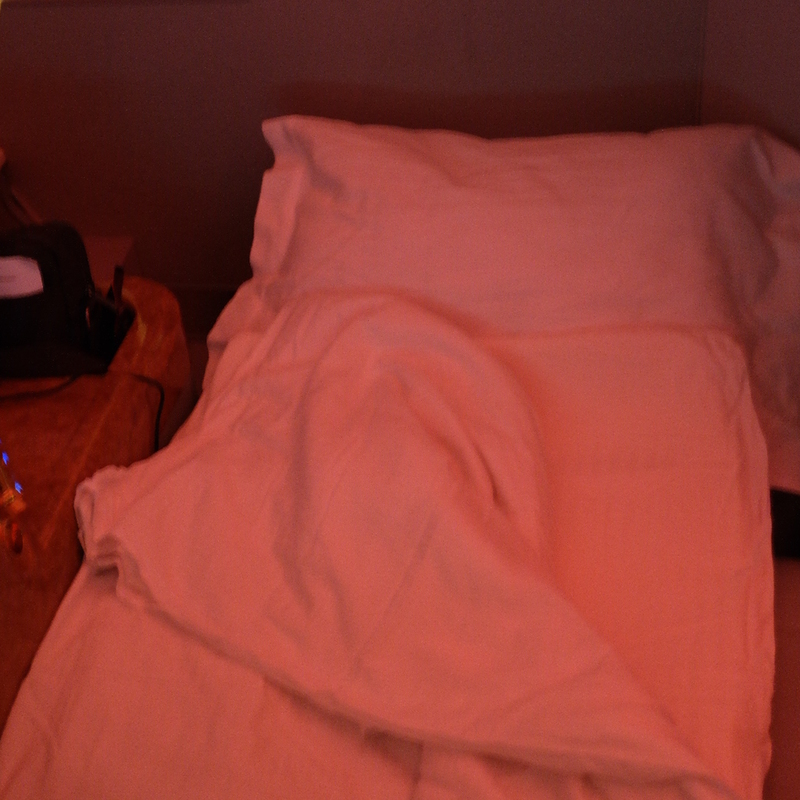 The beds were pretty comfortable – I ended up getting about 3 hours of sleep. About 3 hours into my nap, I woke up feeling pretty bad, you can read about it here, but suffice it to say, I had an allergic reaction to something, still not sure what. After my extended stay in the shower spa, I was able to rest some, and the crew were graciously able to offer me a different time to shower. This was after all, the whole point of flying this aircraft, I think they’d have to have taken me off the plane in a stretcher before I’d skip the shower at 40,000 feet. 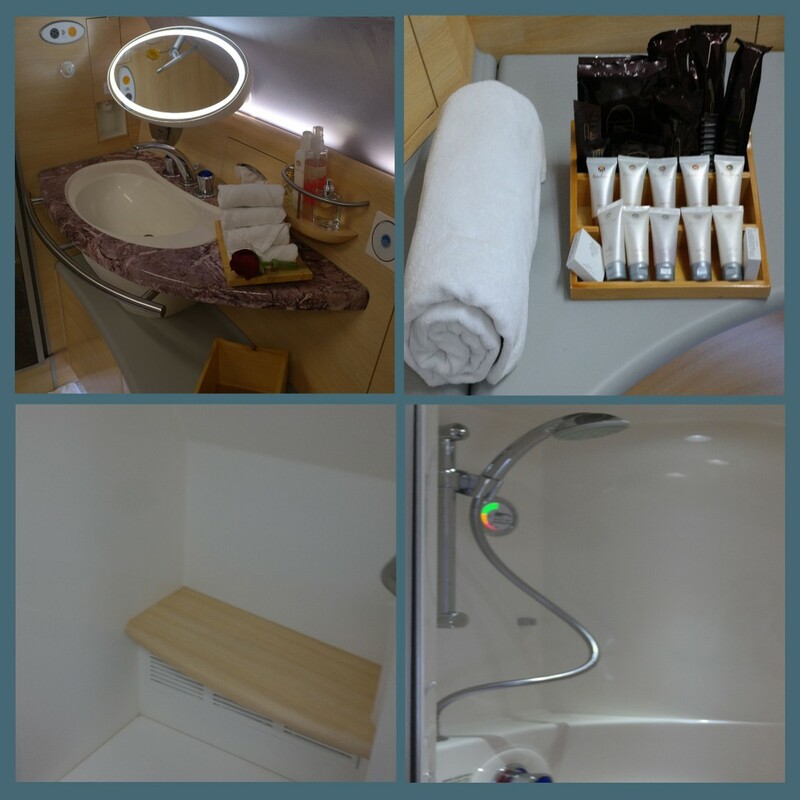 Here’s a brief look at the Shower Spa — I’ve got a better selection of photos from the second flight (my head was more in the game, shall we say). 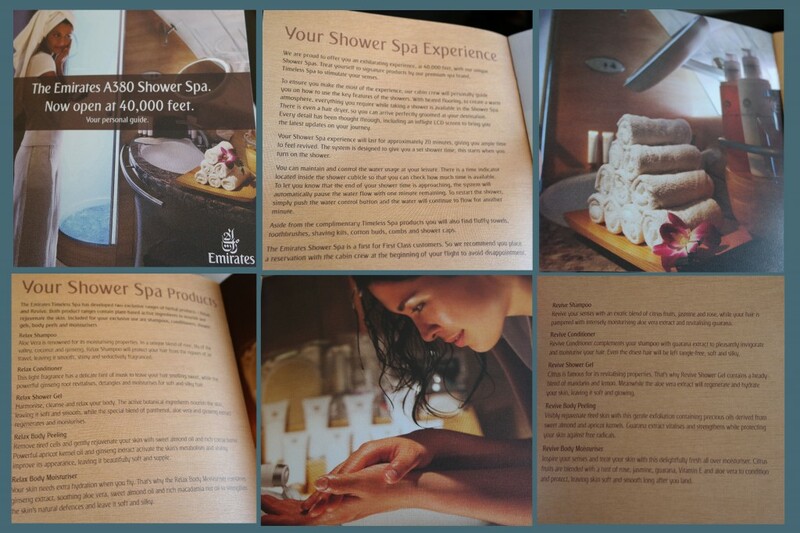 Although you can see the “Relax” and “Refresh” sets of soaps/shampoos etc., even body scrubs in the upper right photo. Behind those, there was even a loofah (which I understand goes very well with the body scrub). Overall, the flight was great, sans my allergic reaction. That said, the crew’s training really shined through there, and I am truly grateful for that. 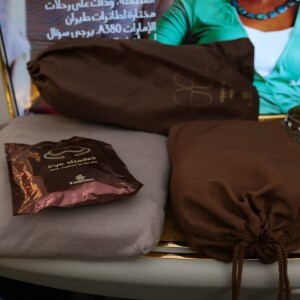 Aside from that experience, the hard product is great, the soft product was great as well. I definitely felt like this was an A-team caliber crew.